"Let's Face It" campaign as a powerful visual way of expressing worldwide public opinion to urge the New Zealand government to take immediate measures. Your visual petition (VP) photo of you along with a selected image of a Maui's or Hector's dolphin acknowledges specifically that you want to save the Maui's & Hector's from extinction. • Critically Endangered Maui’s & Hector’s Dolphins are endemic to (found only in) New Zealand, and have suffered drastic decreases in population primarily due to entanglement/drowning in gill net trawling and recreational set nets since the 1970’s. • Thousands of marine scientists internationally, along with 50 national and international organisations representing over 20 million concerned citizens globally, voiced concern to the New Zealand government urging immediate protective measures outlined to avert extinction of Maui’s and Hector’s dolphins. • In April 2013, the Society of Marine Mammalogy with a membership of approximately 2,000 scientists from 60 countries, sent a letter of concern to the New Zealand government urging immediate protection from known and impending threats to Maui’s dolphins. • In June 2013, the International Whaling Commission (IWC) Scientific Committee addressed concerns to the New Zealand government outlining measures urgently needed to avert extinction of Maui's Dolphins. • During a public comment period on measures the NZ government should take in addressing the issue of saving the Maui’s Dolphins, over 70,000 submissions including 4,856 "Let’s Face It” Visual Petitions were submitted in favor of protecting Maui’s dolphins vs less than 15 opposed. • In addition to deaths caused by entanglement, seismic exploration for offshore oil, minerals and seabed mining pose new threats to the habitat as well as physical well-being of these dolphins. 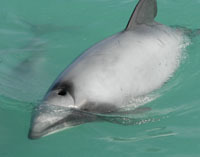 More recently, Simon Bridges, Minister of Energy (NZ) opened to offshore oil exploration in the area proposed as a sanctuary for Maui’s Dolphins. • Despite the alarming decline, and official letters of concern from international marine scientists and widespread public voice, the New Zealand government continues to refuse to adequately protect these dolphins from known threats leading towards eminent extinction. Through “Message to the Minister”, we now call upon Hon. 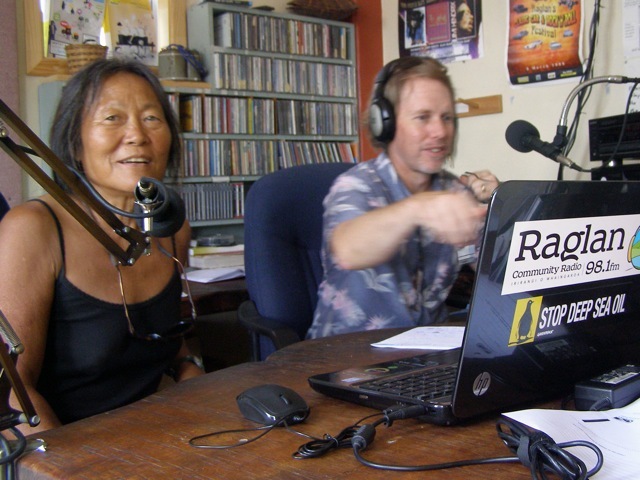 Maggie Barrie Conservation Minister, to pay heed to those who have spoken in this video, including the advice and comments of all listed above, to take full protective measures for the Maui’s and Hector’s dolphins. It is time to do the right thing, …before it is too late. With only 55 (or less!) 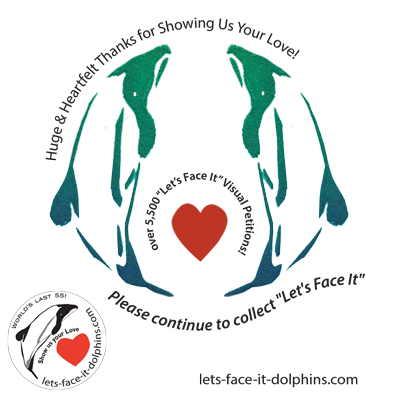 left, critically endangered Maui's dolphins urgently need your help today! TAKE ACTION: We now have nearly 9,400 “Let’s Face It” Visual Petitions! Please join our “Let’s Face It” campaign as a powerful visual way of expressing worldwide public opinion to urge the New Zealand government to take immediate measures. 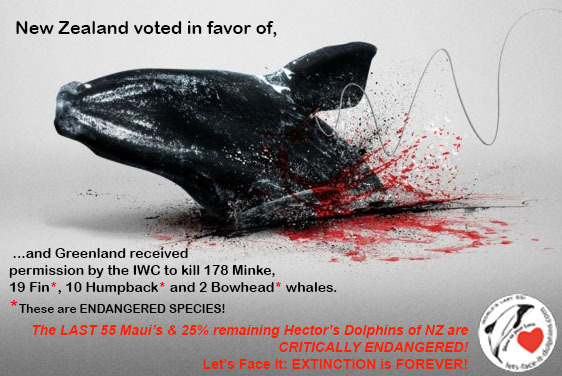 Because populations have drastically fallen to less than 25% of Hector’s dolphins, and now only 55 (or less!) Maui’s dolphins left. 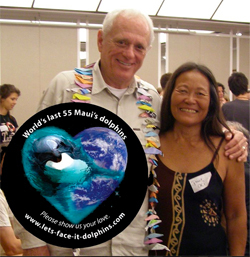 Your visual petition (VP) photo of you along with a selected image of a Maui’s or Hector’s dolphin acknowledges specifically that you want to save the Maui’s & Hector’s from extinction.